With Christmas just around the corner, everyone is busy trying to finish up their shopping. 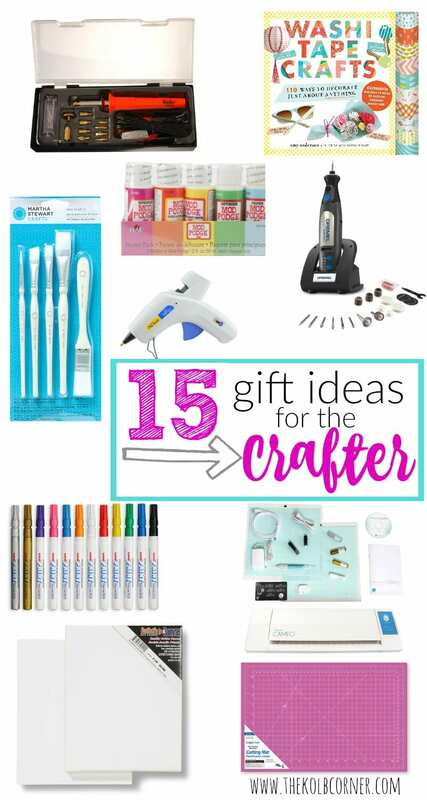 If you have a DIY-er on your list and you have NO idea what to get them, I’ve come up with 15 gift ideas for the crafter. Whether you are spending under $10, or you want to splurge, there is a little bit of every thing on this list. Two-Temp Cordless Glue Gun –A hot glue gun is a MUST have for any crafter. Heck, everybody for that matter. I’ve even used my glue gun to hem pants. Yes, you read that right. Hem.Pants. Don’t ask. Mod Podge Starter Pack –Every crafter needs a little mod podge in their life, and what’s better than a starter pack that has all of the finishes? Plaid:Craft Martha Stewart Basic Brush Set –How about some good brushes to go along with that mod podge set. Stretched Canvas, 2-Pack –You can never go wrong with a blank canvas. Self-Healing Cutting Mat with Grids –I use this mat all the time, whether it’s for cutting paper, fabric, or just to have a surface to craft on. Paint Marker Assorted Colors, 12-Pack — I’ve used these markers in a lot of my hand painted projects. For me a paint marker is much easier to control than my unstead hand, especially when it comes to letters. Washi Tape Crafts –This book has been on my wish list since it debuted earlier this year. I have a huge collection of Washi tape and would love to have this book on hand for some project inspiration. Weller Woodburning & Hobby Kit –I think these woodburning tools are so nifty! You can do a lot of neat crafts with it, and it’s not very expensive. Portable Craft Case–Every crafter needs a case to carry their junk supplies around in. Martha Stewart Acrylic Paint Best Selling Colors–Because a crafter can never have enough paint in their arsenal! Dremel Micro with 8 Accessories –I love this handheld dremel! It’s easy for my freakishly small hands to hang onto, and it’s a DREMEL! You can use it to do just about anything. SINGER Sewing Machine –If your crafter is someone who wants to learn how to sew, or is just starting out, this is a great beginner machine. Storage Cabinet–My current craft room is overflowing with scrapbook paper, cardstock, ribbons and other random embellishments. Having a storage cabinet like this one comes in handy to keep everything in its place. Silhouette Cameo — Starter Bundle — I’m pretty sure that owning this machine is every DIY-er’s dream. So if you’re feeling overly generous, this is THE ultimate gift idea for the crafter. And if you aren’t sure if your crafter wants or needs any of these items, consider purchasing them a class from Craftsy. There are tons of different online courses to choose from–wood working, paper crafting, sewing etc. Your recipient will be able to choose which class he/she would like to take. Awesome list! I think I really want that wood burning kit, I’m sure I could do something awesome with it. And that washi tape book looks like too much fun! I have a few little projects in mind for my woodburning tool! And yes, I think I may just gift myself that Washi tape book.